My inquiry into personal finance started right as an undergraduate and for me it has been an evolving journey , the interesting thing for me now is that I am not going it alone. The best way to go far is to take as many people as possible with me. Today I continue to take as many people as possible with me by always sharing ideas and strategies on personal and financial mastery. This is the reason why I love helping as many people as possible raise their financial intelligence on their journey to financial freedom. I first came in contact with Reverend Sam Adeyemi’s resources by radio programme as a secondary school student. Everyday I would anticipate learning valuable insights that he shared at 7am on SuccessPower on OSBC Radio, just before I finally leave for school. After that I have read a couple of Pastor Sam’s book, and I currently have been privileged to attend one of his live seminars. Each time I encounter his material, I take practical steps. 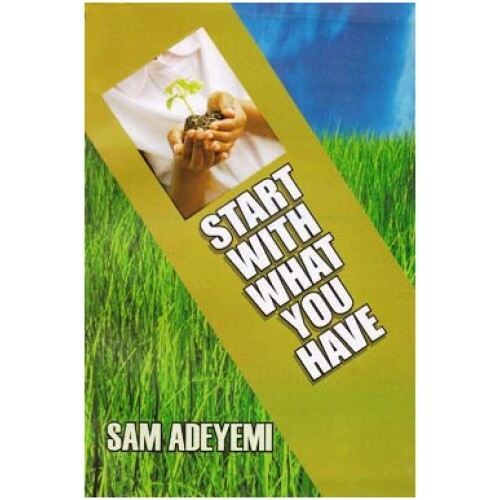 Start from With What You have with Sam Adeyemi was a book I read as an undergraduate on the 22nd of February,2009. The zeal to apply what I learnt then made me begin a book blog and a small book sales business on weekends when on break from my job as an Electrical Engineering intern. Here I have scribbled a few vital lessons i has penned down from the book. When God puts a seed in your life, He creates a need for that seed. In fact, God usually puts the seed in you because there is already a need in the world. Opportunity eludes so many people because they look too far from it. Dream big dreams, big dreams attract big people, small dreams attract small people and small people create big problems. He is also Principal Consultant at Emmandus Networks. A Consulting, Engineering Technology and Logistics company. Emmanuel is a disciple of Jesus Christ, he currently works and lives in Lagos Nigeria with his beautiful wife Jumoke and their lovely son Daniel.